Our 39mm toughened and laminated walk-on glass panels are available in various sizes online, or contact us for any bespoke requirements. Our price shown is for the glass panel only – steel support frameworks can be made to order as required, please contact us for more info. Non-Slip Invisible Chemical Coating : Invisible to the naked eye, this chemical treatment makes the glass anti-slip and will last approximately 5 years. Backpainted Border : A back-painted border to the glass edges, 50mm as standard (ask for other widths) that can be used to hide the underside of the glass where it is seated- especially useful for disguising any silicones or adhesives used to secure the glass in place. 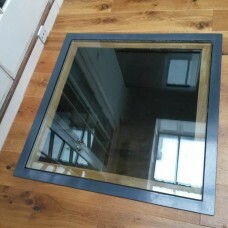 All our walk on floor glass panels are made to order and will take approximately 3 weeks to prepare. Once ordered, your glass will go into production and our dispatch team will be in contact to arrange delivery when the item is ready for shipping. 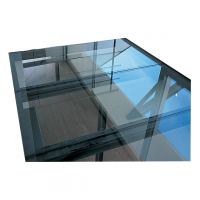 Every walk on glass panel is supplied in laminated glass for safety and can therefore be described as walk-on-glass. The thickness required will depend on size, location, building use and structural support so if in doubt, please contact a structural glass engineer for confirmation. 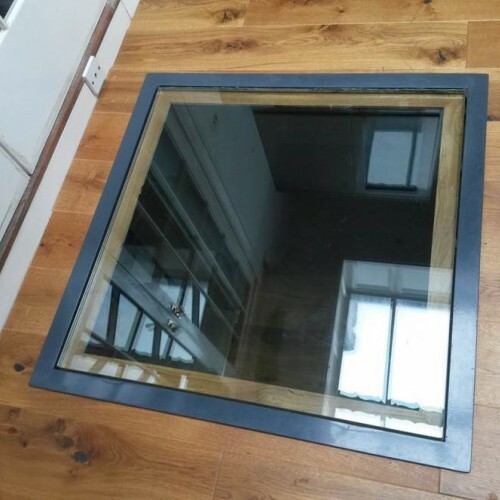 17.5mm thick toughened and laminated glass - All sizes available including a bespoke cutting service..
Our 31.5mm toughened and laminated walk-on glass panels are available in various sizes online, or co..
Our 33mm toughened and laminated walk-on glass panels are available in various sizes online, or cont.. External grade 316 stainless steel glass clamps. Suitable for 25.5mm toughened and laminated gl..